I know that my turrets aren’t lvl 8 yet but other than that, is my layout good? Please let me know where I can improve. Last edited by DeathStriker on Sun Aug 19, 2018 8:58 am, edited 1 time in total. HellWrex wrote: I know that my turrets aren’t lvl 8 yet but other than that, is my layout good? HellWrex - As a Level 8 you will be visited by mostly HQ 10 Players and as such it will be difficult to defend / avoid 3-Star Defensive Attacks. THE GOOD NEWS is that by the Opponent 3-Starring your Base you will lose less Resources than having a Base that prevents an attacker from getting 1-Star where you get attacked multiple times. Think about swapping Mortar / Rocket Turrets (while they are still Level 7) to Bursts. Place all Barracks / Factories under Shields. Some veteran Empire Commanders may be able to give better advice. 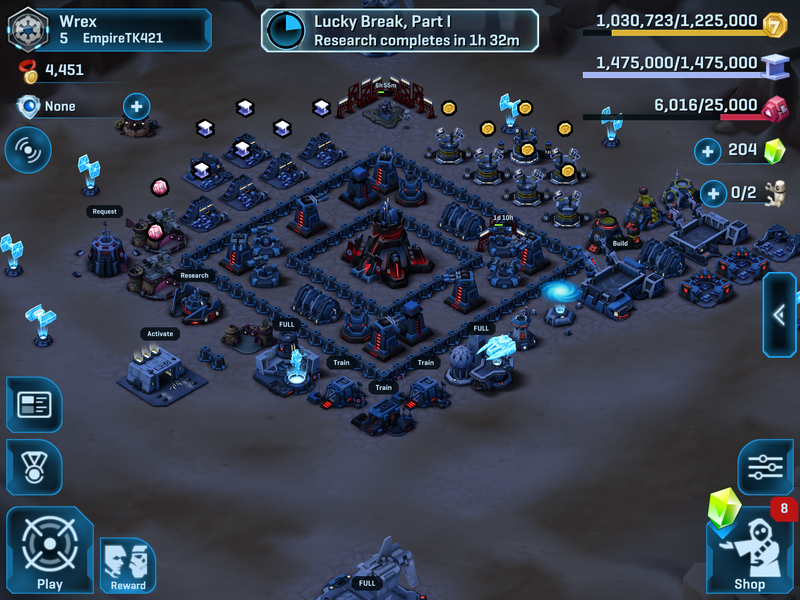 Attached picture of my level 8 imperial base. I had to log in to view it from my main account so couldn't screenshot all the traps etc but have marked them in red stars. If you want to see closer look up account 'nEggs' in squad 'powdermonkeys'. For armory equipment I go with Sniper GR, Rodian Snipers, Burst Heat Sink, Rocket Heat Sink, and Reinforced Walls. Try and get your armory maxed out for your HQ level so that you can maximise the equipment buffs. In my Squad Centre (SC) I ask for Snipers so they also get the Rodian buff. If you have not many lvl10 guys in your squad try and find a squad with more, so that you have lvl10 troops in your SC. First big point I noticed is what level is your SC? It looks to me like it may only be level 3 or 4. This is crazy. In my view the SC has to be the first building to upgrade as soon as your HQ is upgraded. Having more capacity is crucial to both offense and defense, especially in squad wars. Some other tips I find work well. -Keep your SC under shields in the centre. Where you have placed yours the enemy can easily bait you troops or take it out with air before your defenders get a chance to deploy. -Keep you shield generator perimeters within your wall boundary. This means attackers (other than jets) have to shoot through the walls before they can pop your shields. -Keep you barracks under shields, this will help them last longer and hopefully let multiple waves of guard reserves deploy before they are taken out. -Only run two types of turrets. This way you can buff both of them with equipment. Turret heat sinks effectively double the power of your turrets. Think of it as 16 turrets all buffed being kind of like having 32 turrets. If you only can buff half your turrets due to having too many different types then you are limiting your firepower. A few months ago rapid fire turrets power got massively reduced and burst turrets increased. Bursts have one less tile range but also get 120% multiplier against jets and bruiser units. Also there is pretty much no point having mortars these days especially since more often you probably get attacked by Jets and vehicles, not ground infantry, so i'd be switching them out as well as your rapids. -Final note on turrets. When you upgrade your base to 9 dont be too tempted to switch for sonics. Sonics under level 9 are pretty useless because the percentage damage isnt great. I preferred to keep with bursts and rockets until I had upgraded them to level 9 and only then switched some to sonics. Phew, thats all for now, I hope that gives you some ideas. #1 get upgrading your SC!!! Feel free to ask more questions.